A Journey of Timeless Elegance with Celest Thoi! Wondering what ring to get when you pop the big question? Looking for the perfect wedding gown to walk down the aisle with your loved one? 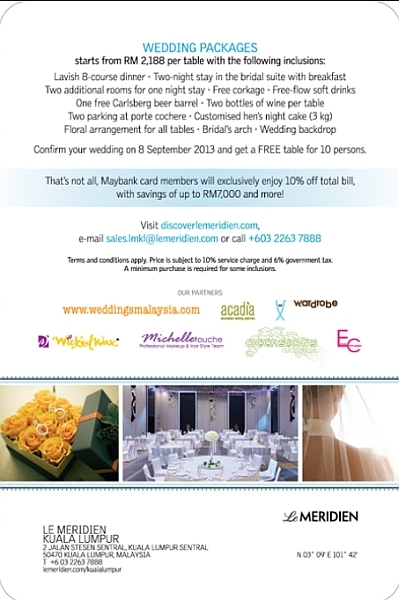 Cracking your head over where to host your wedding dinner for that platoon of family members and friends? 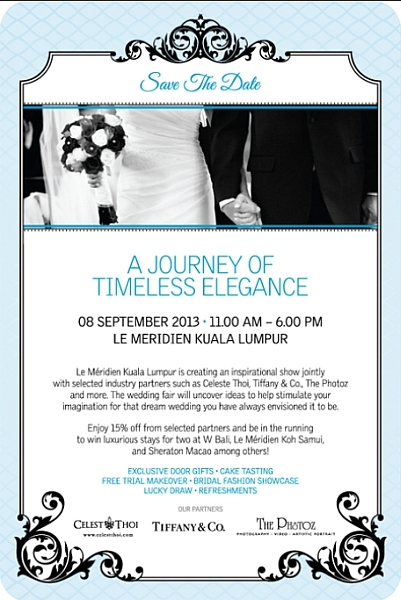 Well, if these burning questions are causing you sleepless nights (or if you happen to be free on a Sunday afternoon), swing by the Le Meridien KL on the 8th of September for a very, very special event! Yes, Celest Thoi (moi) will be joining forces with diamond design giant Tiffany & Co, The Photoz and many more industry players to bring to you an event not to be missed! A Journey of Timeless Elegance is an occasion which will serve to inspire and jump-start that creative spark in all of those in search of a dream wedding. With plenty of activities lined up for the whole afternoon, there’s nary a dull moment in sight. Whats more, if you were already planning to throw a grand party, why not have a look at what the Meridien has to offer? Bargains abound, with the hotel management pulling out all stops to ensure that you have the most memorable wedding you could imagine. Take a look at the items on offer, and you’ll see that they’ve thought of practically everything! The wedding package provides a whole list of services (short of finding you a wife/husband), guaranteed to ease your burden of planning a complicated wedding dinner. Celest Thoi will also be showcasing a bridal fashion show at about 2.45pm…do pop by to support if you are in the vicinity. So, if any of this has piqued your interest (or you happen to be in the general vicinity) do drop by and say hi!